I remember being close to delivering Bria, my first child. I couldn't wait to not be pregnant anymore, as I'd had enough of that, but to actually have to take care of a real live baby? That scared me enough to think that maybe being eternally pregnant might not be so bad. Of course, she eventually came (two weeks early!) and though I loved her intensely on first sight, my world was turned a bit topsy turvy. At first, it was the lack of sleep--I remember putting her down for a nap in the middle of the day when she was just a few days old and falling into my bed myself. The ringing of the phone brought me out of my deep sleep and I thought I should answer, but when I tried to get out of bed my body was so exhausted that my legs couldn't even hold me up and I fell to a heap on my bedroom floor. I quickly learned to sleep whenever I could, telephone and all other interruptions be darned. Later, the lack of sleep grew into worries I had never even thought about before I became a mother. My concerns over potty-training and preschool have now become puberty and peer-pressure concerns, but still, every day this motherhood thing throws me for a loop. It's hard. It's exhausting. It really is like watching your heart walk around in someone else's body--or three someone else's bodies. And yet I love it. It is the most rewarding thing that I have ever done, and will ever do. 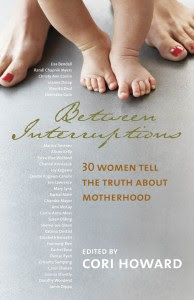 Between Interruptions edited by Cori Howard, is a collection of essays that "tell the truth about motherhood." In the introduction, Cori writes about her own journey into motherhood, and I was so struck by what she said about it. It is a universal truth among mothers that we are all trying to strike some balance between our children and all of the other stuff. For me, the other stuff includes exercise and eating right (a full-time job all by itself), practicing (I have two huge gigs coming up in the next couple months--a lot of music learning to do), teaching (lots of students, lots of time), and things like blogging and keeping my house clean and getting out of debt and hundreds of other little things that I do to keep my soul alive and thriving. Perhaps the one mark of distinction for today's mothers is our widespread sense of dissatisfaction with the way things are: with our "motherload" (the career, the kids, the house, the husband), with gender roles, with society's expectations. It's hard to be satisfied when you are brought up to believe you will have a fabulous career, a fabulous family, a fabulous social life and a fabulous house, and when you suddenly find yourself with all those things, you realize it's not at all fabulous; that having all those things means losing yourself; that motherhood has much more inherent value and joy than we were ever taught to believe; that having a job and kids and an "equal" relationship or marriage is highly stressful, and not always possible. And I think that's just it. Today's generation of women has been brought up to regard motherhood as somehow lesser, and not worthy of all of our time. And yet, if I had my choice, I would drop all the other stuff out of my life and focus entirely on my children. And that would be okay with me. Already I do everything I can to make sure my children have many opportunities, even though that means working part time so they can have their music lessons or running on 5 hours of sleep so I can help them with homework and practice, as well as spend good quality time with them and still get the other stuff done. There's a long list of sacrifices I make for them, and every mother has a comparable list. This book takes a look at women from all walks of life and how they are working to discover the same balance we are all striving for. It's wonderful. You should read it. I was given a copy of this book by the publisher via TLC book tours. Overall the world and society has a very warped view of Motherhood. So many women miss so much. So many mothers feel like nothing when they are everything. I'm glad someone has put some good news for mothers in bookform! I think motherhood is so different then it was a long time ago. SO different, so many expectations and desires and pulls. You juts don't get it unless you are one. This sounds like a book every mother should read. I'm glad you enjoyed it! Thanks for being on the tour - I'm featuring your review on TLC's Facebook page today.